In 1902, Theron Bennett was back in town after graduating from college. His rag, "Satisfied," was being played in Peirce City's streets. Soon he would sell the song to a Chicago publisher, move away, and become a celebrated Rag Time Music composer, but in 1902 he was still a Peirce Citian. Another notable person sharing part of his life with this historic southwestern Missouri town, is Harold Bell Wright, author of Shepherd of the Hills. Wright was recruited for eight dollars a week in 1896 to pastor the First Christian Church in Pierce City. It is said that on Sunday afternoons after church, Mr. Wright would sit under the shade trees on the lawn of the church and write stories. Pierce City's pride in its heritage is undimmed by the destruction of most of its historic downtown business district in the May 4, 2003, tornado. 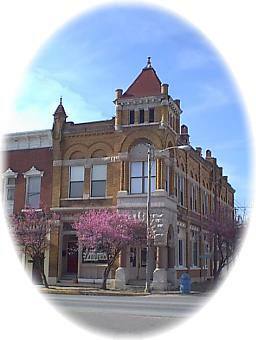 Many historic buildings are still standing in the town and a copy of each of Harold Bell Wright's books can be found at the history museum which survived the storm. Pierce City, named after rail road man Andrew Peirce, was incorporated in 1870 as Peirce City, and then, in a thus-far unexplained historical twist, was reincorporated by a different group, again as Peirce City, in 1871. The "i" before "e" rule has influenced the spelling of Pierce City over the years, as has the widespread but mistaken assumption that the town was named for President Franklin Pierce. The spelling has been Pierce City in common usage since about 1930 or so, but the spelling was not officially changed until the 1980s. The settlement of the valley around Clear Creek in 1832 became the final move of a tired foursome who had been camped in the area for approximately two years. After a two-day exploration in the spring of 1832, two men returned to the camp with the news to their families that they had found "a wonderful little valley, untouched by any hands, white or Indian, with springs all around." Tired at the prospect of uprooting and moving again, but anxious for a permanent home, they all moved to the settlement they named, Clear Creek Valley. Other settlers, many of Irish and German descent, continued to arrive through the 40s and 50s, then growth was clouded by the Civil War and its insidious guerrilla activities throughout Lawrence County. Then in 1870, the prospect of the railroad laying its rails in the Clear Creek direction enticed the settlement to organize themselves into a Village Council to make a formal plea to the railroad who already had another option of routing to a nearby settlement. So the pros and cons went on for sometime, until a communication was received from Andrew Peirce, Vice President of the Southern Branch of Atlantic-Pacific Railway - "I will deed to this town an entire section of land, lying on the north of Clear Creek, and a quarter section more lying on the south side, providing that the town be named Peirce City, that the first formed board accept this name by vote, have it so recorded at the County seat, and file it thus with the post office department." And so with these generous and fortuitous beginnings this town became one of the legion of American Small Towns. THIS BUILDING WAS DEMOLISHED AFTER SUSTAINING EXTENSIVE DAMAGE IN THE MAY 4, 2003, TORNADO. THIS BUILDING WAS DEMOLISHED AFTER EXTENSIVE DAMAGE FROM THE MAY 4, 2003, TORNADO. THE FIRST BAPTIST CHURCH'S NEW BUILDING IS LOCATED ON HWY 97 JUST NORTH OF LAWRENCE COUNTY ROAD 2220 (POWERLINE ROAD).